NYC, 02/26/2019, 6:00PM. 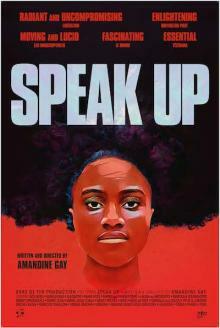 Speak Up (2016): African and African Diaspora Writers and Artists. African and African Diaspora writers and artists have met the 21st century with unprecedented new images and visions of Africa and the world. From Lagos, Johannesburg and Dakar to Paris, New York, London, or Berlin, writers and artists of African descent are mobilizing the resources available to them, wherever they are, to think with the world and redefine the contemporary in their own images. They are re-engendering themselves and acquiring new and active identities, social, political and sexual, in their writing and artistic processes.. In French with English subtitles. The director will be in conversation with art historian Sandrine Colard (African Art History, Rutgers), and poet/scholar Sylvie Kandé. Discussion in English.